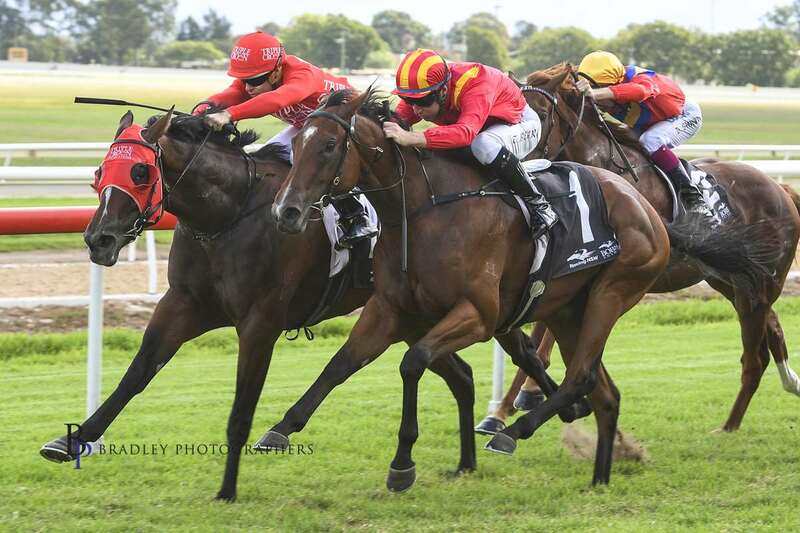 CHELSEA REIGN did plenty wrong but got what mattered right as she finished with no more than a nose in front in the 2YO Maiden Handicap over 1100m at Hawkesbury on Tuesday, with a juicy $30 price for punters. The filly by Coolmore’s Rubick travelled keenly in the early stages of the race under Travis Wolfgram, who gave her an excellent ride stalking the speed on the rails. When the gap appeared she ruthlessly exploited it, and although still showing greeness once getting her head in front, she did just enough to hold off the odds-on favourite Single Blonde to win by the narrowest of margins, as raw talent saw her through to victory. SHARES AVAILABLE NOW WITH THE TRIPLE CROWN TEAM! CLICK HERE FOR MORE DETAILS! The win is a change of fortunes for the filly, who had nothing go right for her in two starts last preparation, but she opened her account here with a fine win in front of a cheering crowd of elated owners! “She did a good job and ran up to her potential today,” said Peter Snowden. Well done to the Snowden Racing team and Travis Wolfgram, and congratulations to our owners for the excellent win!